Wieliczka Salt Mine tour - Polish Tours & Travel Agency - Greetings from Poland! 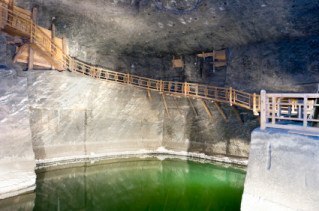 As you walk down the 360 steps into the salt mine, you get the impression of entering a vast underground city, complete with huge caverns and underground lakes. This underground world has earned a place on the UNESCO World Cultural Heritage list thanks to the creativity of the miners who carved chapels out of the walls, hundreds of metres below the surface. You will visit the largest of the chapels dedicated to St Kinga, the patron saint of salt miners. This subterranean church is richly decorated with chandeliers, sculptures, and religious figures carved out of salt. As you follow the 2 1/2-kilometre walk, you’ll pass statues dating back to the 18th century depicting mythical, historical and religious figures. The last stop in the mine is the souvenir shop and a snack bar. From here, the lift carries you back to the surface. The Wieliczka tour lasts approx. 4 hours. Price includes: English or German speaking guide, hotel pick up from selected hotels, admission to Wieliczka Salt Mine, guided walk through Wieliczka Salt Mine tour, lift pick up to the ground level on exit. Additional info: tour twice a day, temperature 14 °C/57 °F of all year round.